I’ve got something a bit different for you today: a web series! A polyamory-themed web series, at that! 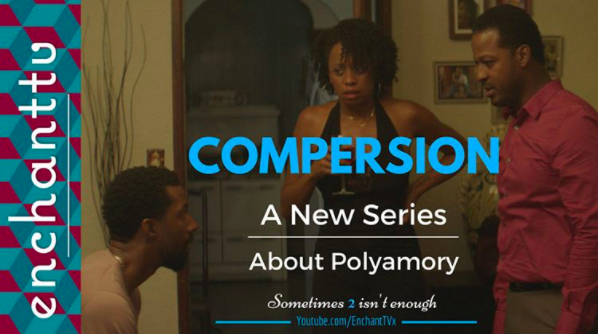 Compersion by Enchant TV is a web series about a monogamous couple that decide to open their marriage and try polyamory. You can watch it on YouTube over here. There’s one season of 13 episodes out so far, and they’re about 10-15 minutes each. I’ve only seen the first 3 so far, and I already love it. It’s just so good! The acting, the script, the scene-setting, everything. A lot of why I didn’t just steam on through the entire 13 episodes in one go is because it’s so good: I want to give it some time to simmer in my head and not eat it all in one bite. That being said, I predict at least another 3 being watched tomorrow because I really want to see what happens next! Another thing that’s really nice about the show is that it has (so far, anyway) an entirely black cast, and a black creative team behind it. Most poly media (web series, webcomics etc) I’ve consumed and most poly communities online I’ve participated in have been just so white, so it’s just such a nice change! Compersion is currently crowdfunding for their second season so check out their IndieGoGo campaign here. I’ve already donated, and you totally should to! Whether you do or not, tell your friends about this and spread the word! You can follow Enchant TV on Twitter @theenchanttv! This entry was posted in Adventboost and tagged adventboost, adventboost 2016, compersion, enchant tv, polyamory, web series by Emma Lindhagen. Bookmark the permalink.